1. Ismael Gozalo. 2 y 3. Messages in a bottle. 4. 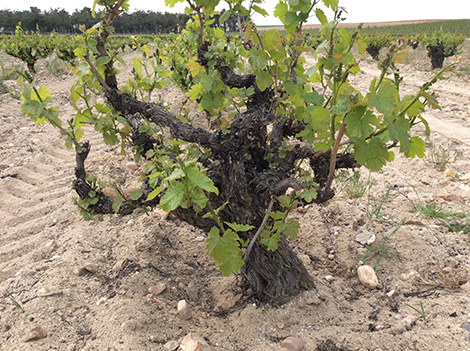 Pre-phylloxera vine. 5 and 6. The winery. 7. Glass demijohns. 8. Tattoos. Photo credits: Amaya Cervera. 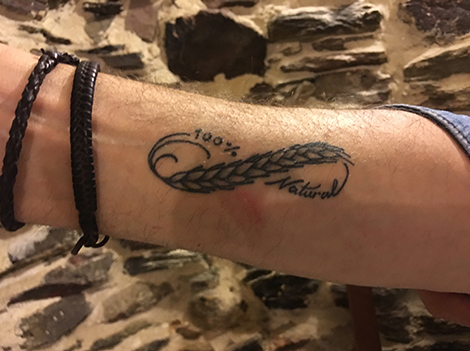 Ismael Gozalo came to the world on October 10, 1971 in Nieva in the midst of harvest. He was the last baby to be born in the village —from that date on, new births were referred to the main hospital in Segovia. These factors may have something to do with his staunch defence of this area’s traditional vineyards and his minimal intervention approach to winemaking. After turning Ossian into one of the leading white wine producers in Spain, Gozalo is now renowned for his natural wines. His wines are imported into France by non other than Jean-François Ganevat, the legendary natural wine producer from Jura, and he has recently teamed up with Benjamín Romeo (Contador, Rioja) to make a white wine called Pirata. Sold in magnum bottles, Pirata was made half-and-half by both producers: each of them sourced and fermented their own grapes that were later blended together and left to age at Romeo’s cellar in San Vicente de la Sonsierra (Rioja). Aside from similar partnerships in the past (notably with Xosé Lois Sebio from Ribeiro in Galicia), this rebel streak helps to explain Ismael’s the free-spirited approach to winemaking. None of his many wines exhibit geographic indications and are simply sold as wines from Spain. Ismael Gozalo makes no more than 45,000 bottles a year in his small winery opposite the church of San Esteban in Nieva. “I’m downsizing,” he says with a broad smile. Quantity is irrelevant to him. 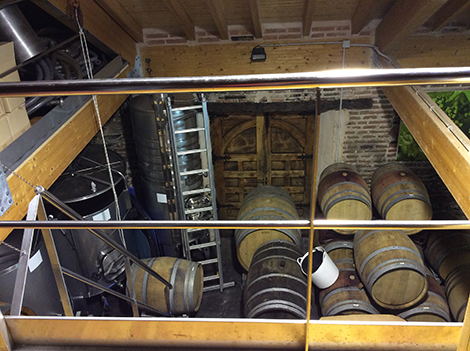 Visitors enter directly to the fermenting room, a mish-mash of barrels, foudres, glass demijohns, stainless steel tanks, full and empty bottles and two presses: a pneumatic press for his entry-level wines and a vertical press for his special wines. Gozalo is not afraid of oxidation. “The must sometimes turns brown, but what is oxidized at this stage won’t be oxidized later,” he points out and reminds that premox issues in Burgundy were due to the use of modern technology that replaced traditional presses. A staunch advocate of light pressing, his wines are outlined at that early stage in the winemaking process. His natural wines are pressed with whole bunches, whereas those that include a small amount of sulphur prior to bottling —as in the excellent Sin Nombre— are destemmed or partially destemmed. With yields of about 250 litres per 450 kg of grapes, the leftovers that don’t fit into a 225-litre barrel are put into 16-, 20- and 54-litre glass demijohns that are left to age underground. “A demijohn is like a big grape,” says Ismael. This wine is eventually bottled as Frágil (fragile), one of Ismael’s rarest and most expensive whites —his particular quest to achieve Verdejo’s purest expression “so that nothing stands in between the terroir and the bottle”. In a tiny loft in the fermenting room Ismael keeps small tanks containing either early or late harvests which are used as “natural correctors” to add extra acidity or volume or to improve textures. “Volatile acidity is one of my favourite tools, explains Ismael. “Freshness is lost when you harvest late, but volatile acidity can help to revive acidity”. Noon is happy hour at Microbio Wines. Ismael goes out to the street and disgorges a new pét-nat called va-llenaxJonás (a play on the words Jonah and the whale and the expression it’s full, in Spanish). Exhibiting a whale on the label, the wine is a tribute to Jonás, his 20-year-old son who works with him. On the back, a legend reads “We are moved by balance and to prove it this va-llenaxJonás contains 100% love, 100% enjoyment, 100% soul and 1000% passion”. In line with other natural wine producers, Ismael Gozalo’s labels are full of quirky names and statements. 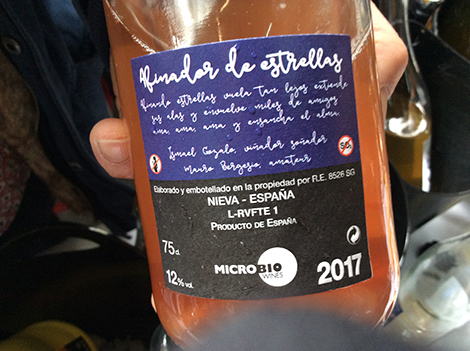 Take his pét-nat Nieva York where it reads “Good bubbles = good moments”, Correcaminos (roadrunner) which is described as a “young, agile, dynamic wine” or Microbio (microbe), his flagship natural wine that features this sentence: “Tiny living creature. This is my tribute to those that give life.” The messages continue beyond his labels and extend to his arms, with a couple of wine-related tattoos (see photo above). 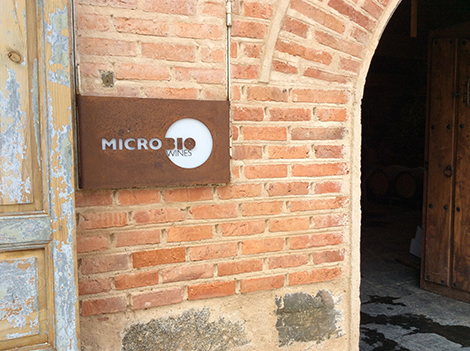 The microorganisms, after whom the winery has been named, play a central role in this business. According to Gonzalo, “wine is a living nourishment that is produced by the action of bacteria, fungi and yeasts.” Accordingly, spontaneous fermentations form the basis of his entire range of wines —the aim is to bring the microbial communities found in the vineyards to the winery. In the underground caves, fungi live undisturbed on the walls. Visitors may note significant variations depending on the kind of yeast in each of the barrels lined beneath. Life, of course, is also an issue in soils. Gozalo is particularly proud of being one of the first growers in Castilla y Léon to be organically certified as early as 1992. From 2014, he has been working alongside WineSeq, a company specialised in vine and wine microbiology that goes beyond geology and builds customized microbial profiles of vineyards. Gozalo’s final goal is to bottle all that life. Perhaps, this is why most Microbio wines taste so good several after several days left open. 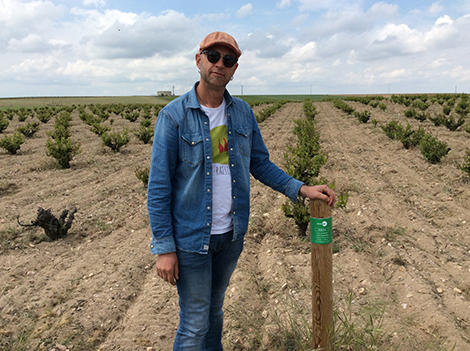 Vineyards in Segovia are a world away from the extensive, highly mechanised Verdejo plantings seen from the A6 motorway as it passes through Medina del Campo and Rueda, in the province of Valladolid. The scenery here is dotted with small plots of vines against a backdrop of pine forests. The magic of the place lies in the amazing concentration of pre-phylloxera and ungrafted vines which escaped the plague thanks to the area’s sandy soils that prevented insects from building solid tunnels to the roots. As well as sand, this area also features gravel, schist and clay. Gozalo has named one of his wines, La Banda del Argílico, after the clay bands that keep microorganisms at a depth of 40 to 50cm and bring freshness to the soil. Ismael Gozalo owns 28 plots scattered across 27.5Ha, all of them within the boundaries of Nieva. On a good year, he may sell up to 60% of the harvest to other producers and keeps the rest for Microbio. He always describes himself as a “transmission belt”, someone in charge of tending a unique heritage that must be passed onto the next generation. A few years ago, Ismael did a massal selection of 150 plants completed with a second selection that was used to plant six hectares with different Verdejo biotypes in the area. Volume and minerality stand out in these Verdejo grapes in contrast with the intense, herbal profile of the variety grown in Valladolid. 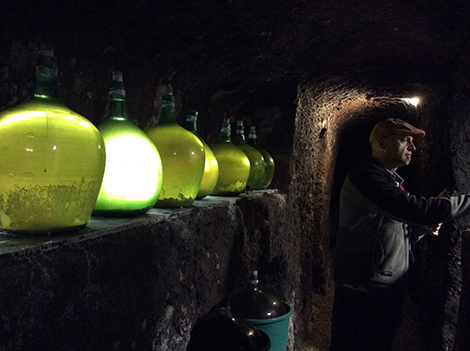 For Gozalo, making wines with no sulphur was a natural process. Ossian whites were low-intervention and terroir-driven, made with spontaneous fermentations to help them age well. “You go from making small adjustments with sulphur to stop using it,” Gozalo explains. Despite the extensive, slightly confusing range of wines (most of them are listed here), Gozalo stands out for his multidimensional approach to Verdejo that goes well beyond oak ageing wines in various types of containers. He makes pét-nats like Nieva York and va-llenaxJonás, wines fermented and aged in clay tinajas as an orange wine (Kilómetro 0) and without skins (Issé), and he works with cloudy musts in a reductive environment (Rack) or aged in glass demijohns (Frágil). Broadly speaking, some wines are more fruti-focused while others feel sharper and more mineral. Two new ranges are in the pipeline. The first one, called “Circunstancial”, features wines made in adverse or in singular circumstances. The first wine to be launched is a 2010 Verdejo (a cold vintage) inspired by Ganevat’s extended-ageing Les Vignes de Mon Pere. Gozalo’s wine, which still remains in barrel, is truly serious with bright acidity. The second one, EvoLuci-On (sic), uses Sherry casks. I tasted a subtle, almost ethereal 2013 aged under a veil of yeast. 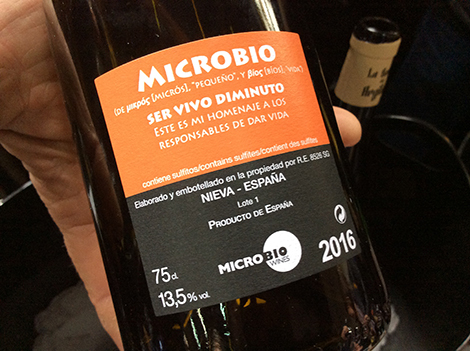 In the meantime, there are many and very different Microbio wines in the market. My tip for those who are not yet familiar with natural wines is to try the pét-nats first… at any time of the day.